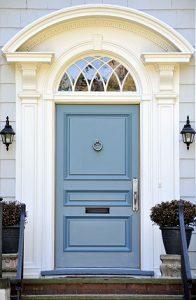 Want to change the color of your front door but don’t know where to start or how to choose the perfect complimenting color to your home? Use this guide to make the best decision and give your home a whole new, updated look! 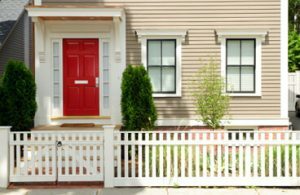 There are a few factors to consider when choosing the best color for your front door. You may be hesitant to break out of the norm simply because the front door is there for all to see — your neighbors look at it, anyone that drives by will see it, and most importantly, you have to see it every day! If your home already has shutters, you’ll want to take that color into consideration. A front door can either be the same color, a contrasting color, or a complimenting color. For example, if your shutters are black or white, almost any front door color would work. 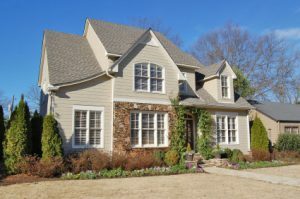 If your shutters are brown, your front door color could be a complimenting earth tone. Take the roof color into consideration when choosing the color for the front door. One suggestion is to take a shingle sample to your paint store and choose a complimenting color. Believe it or not, the age and style of your home plays a part in choosing a color for the front door. 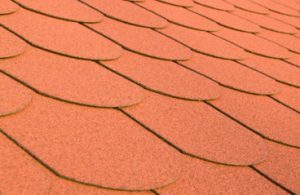 For example, if your home is Victorian in style, a modern orange would not be the best color choice! Whether your home has aluminum siding, brick, wood, or stone, the color of your front door should compliment it. For example, if you have stone, opt for one of the darker colors you see. That will help your front door to stand out as well as bring out the colors in the stone. 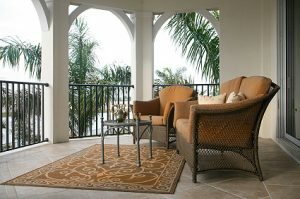 Another factor you’ll want to consider is any outdoor furniture you already have in your design scheme on your front porch. An interesting front door color choice could be something that brings out a certain color in the fabric. When was the last time you updated the color of your front door? Please contact us with any questions and feel free to browse the rest of our site for a wide variety of unique barstools! Download our free guide on selecting the right bar stools for your home or business.